After having spent six beautiful weeks in Europe I am on the road again – first to Tanzania, then back to Nepal and later in the year to Pakistan for work . Europe was beautiful and I really enjoyed Bavaria, my friends’ and family’s company, the peace and quiet as well as the feeling of not having to go anywhere. Having said that, it was also nice to get on a plane again and fly into the big wide world and go back to Kilimanjaro. I am leading a trip and I am due to take six people to the highest point of Africa. We are heading out on Tuesday, 7th August and should reach the top of the African continent on 11th August in the morning. It is currently the dry season here in Tanzania and the weather looks fantastic – I am very excited to be back here. Just before I left, I was contacted by the Bikewear company, Pearl Izumi, who asked me whether I would be interested in some of their sample clothes and either use them for myself or take them to one of the places I am going to. They sent me a big box of very nice outdoor gear, some of which I kept for myself and some of which I took with me to give to some people in Tanzania as well as Nepal. 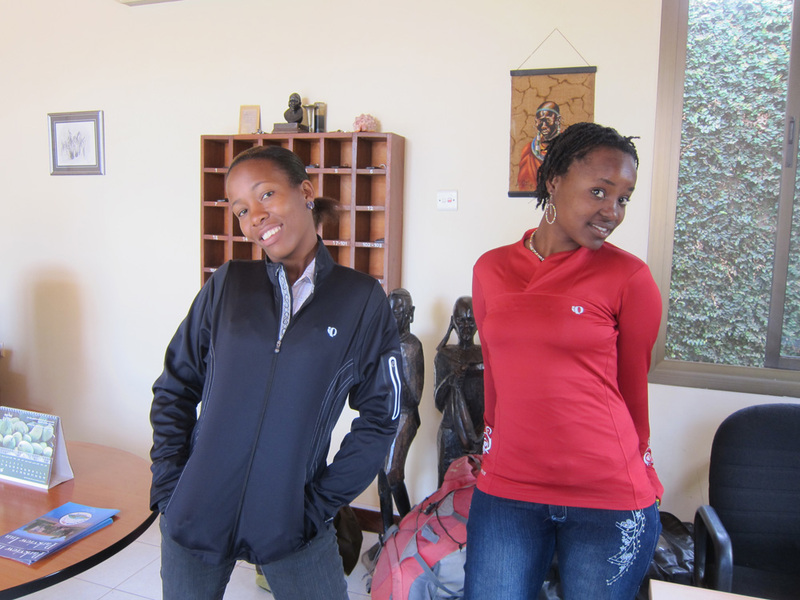 Here is a photo of Marie and Leah from Moshi, who I gave a couple of tops to. The rest of the stuff will go to a few porters and to some of my Nepali female climbing friends. Thanks Pearl Izumi. I would also like to thank Kiku, an apple grower , for contacting me and asking me to take some of their things (yes, I have taken a few apples, baseball caps and T-Shirts) to Nepal. And I would like to thank Claus of the German Outdoor company ‘Auf und Ab” to provide me with an ultralight Exped sleeping mat, which will make my load carrying up the mountain much lighter and my sleep deeper. Thanks to all. After Kilimanjaro, I will go back to Nepal where I am due to help Miss Elizabeth Hawley for a short while before I head out again to try and climb Makalu, the 5th highest mountain in the world. 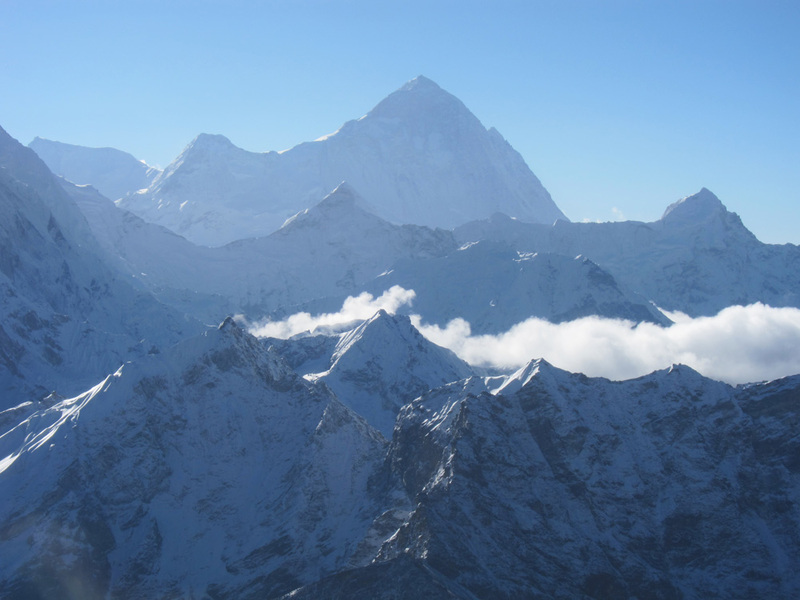 Makalu is situated near Mount Everest and was fist climbed in 1955, when two Frenchmen, Jean Couzy and Lionel Terray reached the summit on 15th May that year. It is one of the more technical peaks and considered a pretty hard climb. I have seen Makalu from many angles, especially from the top of our acclimatisation peak Lobuje East, and to me it has always been one of the most beautiful mountains in the Himalaya, so I am doubly excited to finally get the chance to go there. I am joining an international team, which has been put together by the Swiss outfitter Kari Kobler and will be led by Suzanne Hüsser, a Swiss mountain guide, who I have met on several occasions and who I really like. We will be eight people and it will probably one of the most gender-equal trips I have been on – four men and four women! I know most of the climbers and I am very happy to be heading towards an 8,000m peak again. As I have made a decision not to use supplementary oxygen again, I will attempt Makalu without the use of oxygen. I will try and update my website as often as possible, however, we will only have satellite Internet connection and it might be difficult to post updates regularly. However, if I am lucky my robot will be around and post the odd newsletter for me. Until then I wish you all a great end of the summer and a colourful and beautiful autumn. Hi from PAkistan, sound great, see you in the du end of Sept.